JAYAPURA - In 2020 Papua Province will get the honor to host the 20th National Sports Week (PON) with West Papua Province. This belief is a great pride for all residents of the Earth of Paradise. Since it was announced in 2014, Papua has prepared a lot especially in terms of infrastructure. But there is still one big concern, namely malaria. Malaria cases are mainly found in Eastern Indonesia (KTI), namely Papua, West Papua, East Nusa Tenggara (NTT), Maluku and North Maluku. In Papua alone, Mimika Regency is one of the five regencies in the region that contribute the most malaria cases in Indonesia. The other four districts are Keerom Regency, Jayapura Regency, Sarmi Regency, and Boven Digoel Regency. In order to help reduce the spread of malaria outbreaks in Mimika, Freeport Indonesia through Community Health Development (CHD) together with the Mimika Regency Health Office (Dinkes) collaborated to establish a malaria control center called Malaria Center. This institution is an institution that has the role of advocating, coordinating and facilitating the implementation of the Malaria control program in Mimika to eliminate Malaria in Mimika in 2026. Freeport Indonesia CHD Manager, Govert Waramori explained that this mitigation effort is important in order to support the implementation of the National Sports Week (PON) in Mimika Regency in 2020. "We are collaborating and coordinating with the Mimika District Health Office to revitalize malaria control efforts. The hope is that in achieving the Mimika District target of being free from Malaria in 2026, we can also protect the Malaria problem from interfering with the implementation of PON in Papua," said Govert. Govert also said that Freeport is committed to supporting the Malaria Center in realizing the target of the Papua Provincial Government to eliminate malaria from the land of Papua in 2030. 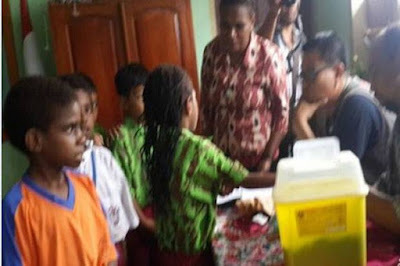 According to Waramori Government, this effort can be successful if all stakeholders under the command of the Health Service can go hand in hand to eliminate malaria for the success of PON 2020 in Timika. Govert also explained that Freeport fully supports the program implemented by the Malaria Center to welcome the implementation of PON in 2020. Iswandi, as the Malaria Center's technical field coordinator, explained that the institution he was leading struggled to combat malaria in Mimika Regency since 2013 with full support from Freeport and the Mimika Regency Government. Iswandi explained, several achievements have been made by the Malaria Center. In 2013 the institution he led carried out insecticide spraying on 17 thousand houses in Timika. In the following year, in 2014, this number increased to 24,037 houses, and in 2015 to 24,958 houses. Not only insecticide spraying, Malaria Center also installs mosquito nets which number increases from year to year. "In 2013, the number of mosquito nets that we installed reached 34,984 mosquito nets, then in 2014, that number increased to 61,147. Our achievements are also arguably very encouraging. In the 2013-2014 period, the number of malaria sufferers in our region fell by 63.5%, "Iswandi added. In addition to homes, Malaria Center also often conducts socialization and precautions to elementary schools in Timika. As a result, there was a significant decrease in malaria sufferers in the region. Recorded from seven elementary schools (SD) which belong to the Malaria Center working area, found a decrease in malaria positive cases from 88 cases in 2013 to 28 cases in 2016. "This socialization is very important, because people in general do not know what to do to prevent malaria. For example, in the early days we carried out insecticide spraying activities in people's homes, many refused. But with good socialization, finally many came to Malaria Center or to the Health Office to spray their houses, "Iswandi said. The spirit of the community to eliminate malaria in Mimika continues to grow. The socialization carried out in various densely populated areas to education areas such as schools can be well received, as well as by students at the school.